Are you frustrated with those areas of your body that diet and exercise just don’t seem to fix? Pockets of fat that just won’t go away? Now with body contouring you can remove these stubborn areas of fat and create the shape you love. Body contouring is a safe, non-invasive non-surgical treatment for reducing fat and tightening skin. Body contouring is done with a Radio Frequency (RF) Fat Reduction Laser. RF energy provides deep, controlled heating of targeted fat, resulting in damage to the fat cells and subsequent fat loss. RF is non-surgical, not painful, and there is no downtime. RF really does work and is US FDA approved! 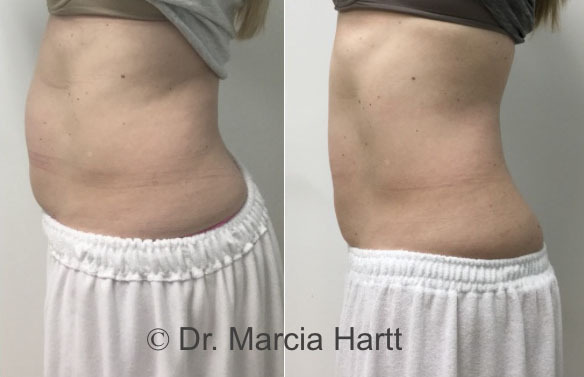 Multiple, large scale studies have been conducted that have proven that RF causes fat loss, inch loss, cellulite reduction and skin tightening. Let us help you achieve smoother contours, tighter skin, and a more confident you. Call today and book your free skin consultation and explore body contouring. What is cellulite, and is it inevitable? Cellulite is a condition that makes the skin look lumpy and dimpled, and usually appears on the buttocks and the thigh. Sometimes called orange peel skin, cellulite is different from other body fat because thin people can have it too. The good news is that treatments are available. Over 80% of women have cellulite, and it’s different from the fat associated with obesity. Cellulite involves connective tissue cords that attach to the skin and muscle. Fat also lays between the skin and the muscle. The fat cannot lay evenly under the skin in cellulitic areas, because the connective tissue cords are pulling the skin down, which then causes the fat to get pushed up giving a bumpy uneven surface. The appearance of cellulite can be reduced by using a Radio Frequency (RF) Fat Reduction Laser. RF energy provides deep, controlled heating of targeted fat, resulting in damage to the fat cells and subsequent fat loss, thereby decreasing the bumpy surface of the skin. RF is non-surgical, not painful, and there is no downtime. RF really does work and is US FDA approved! Multiple, large-scale studies have been conducted that have proven that RF causes inch loss, cellulite reduction and skin tightening. What are you waiting for?! Book your RF treatment today.